Messianic Prayer for Israel and the Association of Messianic Congregations. in the hand of the Lord. If I forget you, O Jerusalem, may my right hand forget its skill. and her salvation as a burning lamp. Pray for the salvation of all Israel (Isaiah 59:20, Romans 11:26), at which time Messiah, Prince of Peace, will return (Hosea 5:15; Matthew 23:39). Pray that the Lord will continue to raise up ministries and individuals who are dedicated to leading Jews to their Messiah. Pray that the Lord will greatly strengthen those who already serve in this most central of ministry fields, and will strengthen the resolve of those who are considering doing so. Pray that, as Saul, many anti-missionaries would see the Light and zealously proclaim the faith they now seek to destroy (Galatians 1:23). Pray that the Lord will increase the witness and fruitfulness of His faithful in the Land. Pray particularly for the protection and fruitfulness of those who are persecuted by individuals and organizations who try to silence them. Pray for the Lord’s protection for Israel and its citizens and for integrity and wisdom for its leaders (1 Timothy 2:1-2). Pray that the Lord will raise up godly leaders. Pray that the Lord will stand against anti-Semitism in all of its forms, whether it be rabbinic (anti-Gospel), doctrinal, social, academic, journalistic, political or economic. 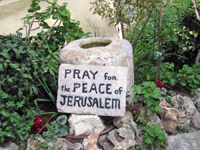 Pray for fair treatment of Israeli and Jewish issues in the media, world governments, and other realms of power. Pray for the establishment of sound doctrine and practice in Messianic circles, especially in regard to the essentials of the faith, Israel and the Jews. Pray that the Lord will grant congregation and ministry leaders wisdom, skill, strength and protection for the perfecting of the saints, for the work of the ministry, for the building up of the body of Messiah (Ephesians 4:12). Pray that AMC members who are not members of Messianic congregations draw strength from the Lord and like-minded believers to hold steadfast in their convictions and move forward in their outreach. Pray that all Messianic congregations, ministries and individuals stand firm and glorify God in their outreach despite opposition by individuals and anti-missionary organizations. Pray that the Lord will grant continued vision, wisdom, skill, strength and spiritual protection to the members of our board: Vice President Pete Koziar, Secretary Mottel Baleston, and Dr. Michael Herts. Pray that the office of President, now vacant, will soon be filled with the right person. Pray that the Lord will continue to use www.messianicassociation.org for the fulfillment of AMC's call in His Name. Pray that He will grant webmaster Mottel Baleston vision, wisdom, skill, strength and spiritual protection in the carrying out of his call. Pray that the Lord will continue to use this email magazine, the Shofar, for the fulfillment of AMC's call in His Name. Pray that He will grant Shofar staff vision, wisdom, skill, strength and spiritual protection in the carrying out of their duties. Pray that the Lord will move in members' hearts for the writing and submission of timeless and timely articles or for taking on an entire feature, such as our previous Messianic Home Life page, or book reviews, or for creating a feature of their own conception. Pray also that the Lord will raise up a partner or understudy for the production of the Shofar in case yours truly kicks the bucket or is whisked away by the Lord for some other reason. Contact Norm at "BibleStudyProject at hawaiiantel.net." Pray for the establishment of sound doctrine and practice in the church at large, especially in regards to the essentials of the faith, Israel and the Jews. Pray that the Lord would open the eyes of the church to bless, and not curse, Israel (Genesis 12:3): to provoke Israel to jealousy (Deuteronomy 32:21; Romans 10:19 and 11:11), to lead Israel to their Messiah, and to love them as they love themselves (Matthew 19:19) with special regard to Israel's chosenness among the nations (Romans 1:16). Son of David Congregation in Gaithersburg, Maryland is seeking a Congregational Leader. Information at http://www.sonofdavid.org/pages/CL-Information/CL_CoverLetter.html. Questions: elders @ sonofdavid . org. (Just remove the spaces.) Application packet: office @ sonofdavid . org. (Just remove the spaces.) Phone: (240) 403-2138. Q. Who may submit prayers and praise proclamations? A. The AMC, a member congregation or an individual member. Q. What types of prayer and praise proclamations are sought? A. * Ministry oriented, not individual needs oriented, though urgent prayer requests for individuals are welcomed. * For Jewish people witnessed to, but not in such a way as to reveal their identity without their permission. * Prayers for Israel or Jewish communities anywhere in the world. * Praise proclamations for answers to prayer that fit into the categories described herein. Q. What are the submission parameters? * Send prayers that will still be current at the next publication date. Publication dates are the 1st of February, April, June, September and November. * Limit total submissions to 100 words. Exceptions will be made at the discretion of the editorial staff. * Submissions will be published, edited or returned for editing at the discretion of the editorial staff. * Similar submissions may be combined by the editing staff into one prayer or praise proclamation. * Send submissions to the editor at "BibleStudyProject at hawaiiantel.net." and if a published prayer is no longer current, please let us know.